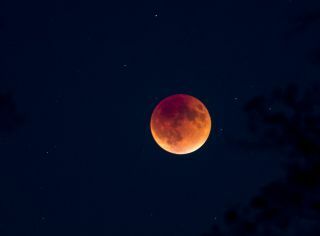 The blood red 2015 "supermoon" eclipse was stunning in the night sky on September 27. Robert Wick, photographer for the BLM, contributed these images to Space.com's Expert Voices: Op-Ed & Insights. The 2015 "supermoon" eclipse was stunning from the dark skies of the Berryessa-Snow Mountain National Monument on the early evening of September 27. The monument, created in 2015 and managed by the BLM and U.S. Forest Service, hosts some of the most scenic and biologically diverse landscapes in northern California. They range from rolling, oak-studded hillsides to steep creek canyons and a 7,000-foot (2,100-meter) peak with expansive views. The national monument is within easy driving distance for residents of the San Francisco Bay Area and the Sacramento Metropolitan region. The 2015 "supermoon" eclipse captured at the Berryessa-Snow Mountain National Monument, managed by the U.S. Bureau of Land Management. Visitors can explore monument lands by hiking on trails or rafting in the Cache Creek Wilderness. These photos were taken along the Cache Creek Ridge Trail. The trees in the foreground of several of the images are blue oaks, which dot the ridges in this part of the national monument. The 2015 "supermoon" eclipse appears between blue oaks in the new Berryessa-Snow Mountain National Monument, managed by the U.S. Bureau of Land Management. A closer look at these public lands will reveal an intricate world of plants, animals and insects that have adapted to thrive in harsh and rocky serpentine soils. These greenish-gray soils lack essential nutrients needed by most plants. To survive these soils, plants must tolerate drought, exposure to heavy metals and full sun. For years, scientists have studied conditions within the Berryessa Snow Mountain National Monument to improve their understanding of these habitats and the specially adapted plants.